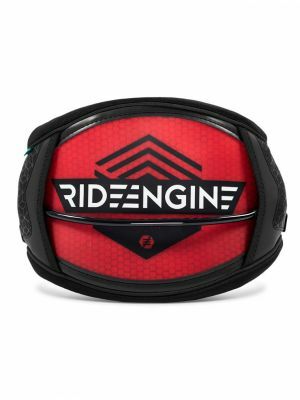 If you’ve ever dealt with a harness that doesn’t fit properly, hurts your back, rides up too high, shifts from side to side, squeezes your waist under load or inhibits your range of motion, Ride Engine’s hard-shell harness is your problem solver. The magic lies in Ride Engine’s innovative hard-shell design that locks firmly into your lumbar and spreads load evenly across your back and sides. Based on hundreds of custom molds taken from riders’ backs, the shell provides unrivaled ergonomics and allows for a low-profile, high-performance fit that will literally change your entire kiteboarding experience. The Hex Core model is made from injection honeycomb core technology. This creates the super strong but light weight shell that the rest of the harness is built around. When compared to the Carbon Elite model, the Hex Core is slightly more flexible. For freestyle and unhooked riding, pair the Hex Core harness with our standard fixed-hook spreader bar. For surfing and general hooked-in freeriding, pair it with our metal or carbon slider bar. 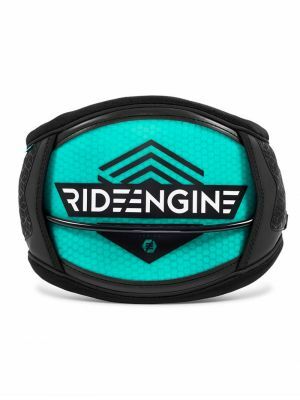 Ride Engine pioneered the hard-shell harness concept and has refined it even further for 2017. The hard shell is ergonomically contoured to the shape and curves of a rider’s back. The shell serves several key functions. Most notably, it spreads load and forces from the kite evenly across the rider’s back and sides. Traditional soft harnesses compress, pinch and fold under pressure, but where they fail, Ride Engine excels. In Ride Engine’s early days, harnesses were custom built, with shells shaped from molds taken from rider’s backs. These molds were saved, and they served as an invaluable tool in generating the precise shape today’s Armor Harnesses are based around. The result is an ergonomic, form-fitting harness that locks into the contours of your back exceptionally well. The Armor Harness has a distinct kink vertically along the center of the shell. This feature, aptly named “Lumbar Lock,” is designed to fit into the center of the rider’s back. This serves two purposes- it provides ergonomic support that matches the shape of your body and it locks the harness into place and prevents it from shifting from side to side. The Armor’s hard shell provides superior back support. Because of this, the harness can be shorter vertically across the rider’s back. This low-profile fit improves rider mobility and range of motion as there is less harness to get in the way or restrict movement. Super soft foam conforms to the shape of your torso for ultimate comfort and hold. The foam is cushy enough that you don’t feel the hard shell from the inside. The idea is to feel the shell’s support but not the shell itself. Sliding rope: For surfing, freeriding and general hooked-in riding, the sliding rope spreader bar will literally change your kiteboarding experience. Your chicken loop connects directly to the rope and slides freely across the entire length of the spreader bar. With a standard hook, your harness twists and pulls from different angles depending on your body and kite position. The sliding rope system allows you to rotate your body freely, independent of your kite position, which in turn allows you to keep your harness locked-in and low where it is meant to be. Fixed Hook: For freestyle riders or those who want the ability to unhook, a standard fixed hook spreader bar is also available. Changing between the two options takes about one minute. Riders who use the hook have given rave reviews about the Armor Harness, mainly for the harness’s low-profile, high support advantages. It allows aggressive riders to hold down more kite, ride harder and move more freely than any other harness on the market. Compatibility note: Ride Engine harnesses are intended to be used with Ride Engine spreader bars. Any modification, pairing with non-Ride Engine components or spreader bars or use outside of the product’s intended purpose is not recommended, many not be safe and will void the product’s warranty.